I'm starting a new topic for LDD 4 Bugs and errors. After some resarch I found the M motor is totally corrupted... Anywere you place it gets deleted... Evne if it the only brick in the file. BUG: Color 297 (Warm gold), which is the gold color in for example Atlantis sets, is missing in the color palette. All other colors (except Maersk Blue) seems to be there. A few things so far. Firstly, if you enable any of visual features, models you could open before will not open if they are really big (LDD crashes). Also, 4.0 is much more sensitive about the illegal placement of pieces, as models I had built in 3 worked perfectly, and in 4.0 I had 56 pieces removed. Also for large models, trying to "check whether model can be purchased" crashed LDD (but its still a really cool feature). The height difference for baseplates is fixed, so the 8x16 is no longer slightly thicker!! Simply Power functions M motor has a catastrophic bug. Anywhere you place it, it gets removed when you reopen model. No excpetions! Aha, you mean 58120. Yepp that was a particularly nasty one. Ouch. Good idea! Can you start a new topic about "fixed bugs in LDD 4"
Can you give an example set (instruction) where this connection technique is used. 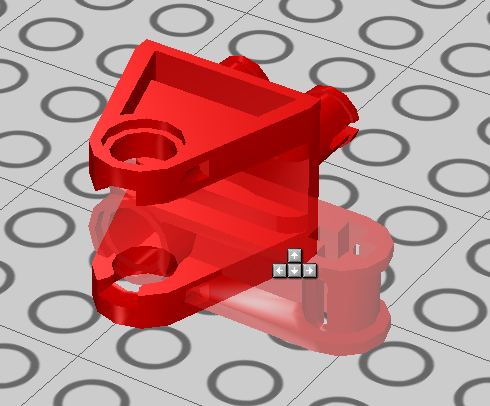 When decorating a minifig head, a lot of the prints don't fit on the screen. A lot? Interesting... I encountered a single print for which that occurred in 3.0. 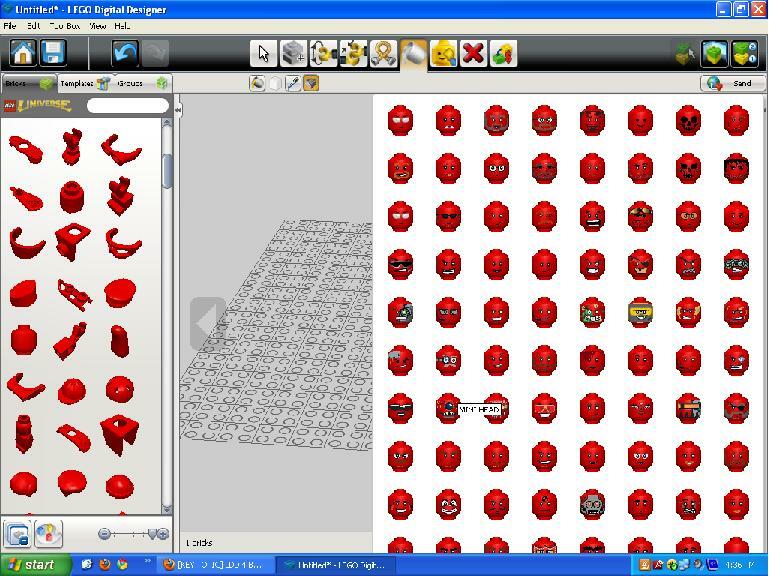 Are you saying there's new prints in LDD 4.0? No. The bottom two rows don't fit on the screen. It's just the old prints, but there are a lot anyways. I'm not sure I follow. Can you post a screenshot please. EDIT: What screen resolution do you have? I found that too. I'm on the same screen resolution. The 'Plate 1x1 w. up right holder' doesn't clip onto the wheel pin of the 'Three-wheeled motor cycle' as seen in the modern SW speeder bikes. Well spotted, but that actually an old bug that hasn't been fixed yet. It's strange as the clip attaches to a 'Bearing element 2x2, double' which is basically the same pin but attached to a 2x2 plate. It's also very odd that they forgot Pearl/Warm Gold. It's a very common colour at the moment. The 'lamp shade' part does not have a hole right through, so bars cannot be pushed through. Part 89670 (the right arm of large Rock Monsters from Power Miners) does not attach to any Technic-pin-click-hinge. That is, parts with the same style of joints as Exo-Force and Knights' Kingdom II. Examples include 87959 (the large Lava Monster body), 85049 (the large Rock Monster body), and 48172 (2x2 with double click hinge). As a point of comparison, part 89669 (the left arm of large Rock Monsters) will attach to any of these parts just fine. The horse (part 75998) also retains a bug from the last versions. There's a certain range of angles which the neck cannot be hinged to. Can someone confirm that the 6942 Lamp Shade has a hole also in the old SCALA sets from the late 90's. Otherwise we might be looking at two DesignID's - one with, and one without the hole.